It is surprising how quickly one person can pick up a habit. One minute I am a lump of play dough ready to be moulded into the most fantastic shape ever, next minute I am a lump of hard old clay that cannot be shaped no matter what. So my task for a month or so has been to find someone who wants to splash a load of water on me and see if I can become a useful item to table tennis. Finding a coach hasn't been easy. As discussed before, nobody wants to train a guy who is 26 and cannot play a sport most people start at the age of 6. My first port of call was England Table tennis. This threw up a few coaches. However, about 2 of them where anywhere near me. One was too far in the end and the other was at a club I had already been to. In all honesty, he was not fussed about coaching me. I even offered him money and still he was not interested. He likes to focus on the kids and, in some ways, who can blame him. I have been looking into table tennis as a sport a lot more now that I actually participate in it. I feel it is good to see what the pros do and gain an understanding of how the matches etc. work in the professional leagues. It also led me on to the video of the guy who played table tennis every day for a year. I have seen the video before when I wasn't trying to become an awesome player. It was amusing for me that somebody would spend so much time at a sport where you basically just stand still and hit a ball with a bat. I also thought that I could do that if I had a coach standing by at all times watching me. Well, I think I can admit I was very wrong on that front! I wouldn't say the video inspired me back then but I do think it made me think it was possible to become good at this sport in a relatively short period of time. That meant that when I was looking around for the sport I would try out it was further up my list than it might of been otherwise. 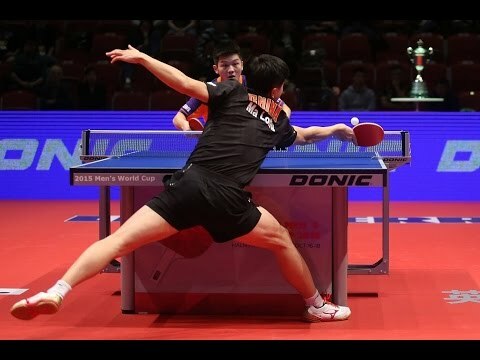 After seeing this video again I went on the website (www.experttabletennis.com). I thought that these guys might have a bit of advice that's particularly useful for me in my position. It turns out that there is a fair bit to be gained from it all when you look around from kit recommendations to training techniques. However, one big piece of information struck me: the coach lives near (ish) me. He is called Ben Larcombe and is a professional table tennis coach. I have to admit when I messaged him I was pretty nervous. I even put this blog in as a reference point. He didn't quite say he would coach me but he did say he runs a club near (ish) me that I could attend. A week or so later I decided to whip down to the other club (sadly it falls on the same day as my 'home' club) and see if I could get a few tips from an actual professional coach. This club is different from the others I have been to. For one thing it is free and for another it is held in a church. Perhaps most surprising, however, was that I was one of the best there. This club is full of inexperienced Table Tennis players like me. People who have played a few months and are just getting to grips with the basics. Our first little session was to practice forehands. Which was pretty difficult for the majority of players. I ended up blocking to take the speed off the ball a bit but it was still a fairly messy affair. I then got what I wanted. A 1 to 1 with Ben doing multi-ball training. This is where a coach stands with a bucket of balls and you return them. Ten minutes of this and I had learnt 2 things and confirmed another. Firstly, my position was too high. I wasn't crouched enough and therefore it was stopping me from executing the correct stroke. Secondly, my stroke was still wrong. It was too forward and I wasn't creating the necessary topspin. Thirdly, my movement was very bad (it still is). The first problem was easily corrected and it helped the second. However, the problem which I had known about for a few weeks with movement was still there. It comes down to panic and a bit of ball watching. Sport, as I have mentioned before, has always been natural for me. Give me a pair of trainers and I can run, naturally, quicker than most people. Give me a rugby ball and I can see space and tackle better than most people. Give me a shuttlecock and I can challenge most people in a game of badminton. In Table Tennis I have zero natural ability to fall back on. Therefore, I have to make decisions rather than have a natural feel to my game. It is this lack of feeling that can lead me into panic. These days though, about 5 and a half months in, I do have feeling. I just forget I have feeling or second guess myself. It means that the movement is too slow or is positioned wrong to execute the shot I want. I also know that once I overcome that I will show myself to be a better player. Having learnt/confirmed these issues. We did some backhands before a bit of a round robin tournament. The first two games were comfortable. Firstly, against Ollie and then against a lad who was deemed to be one of the "better" players. He certainly has attributes but it was unrefined and I felt very comfortable. Once I had beaten him we came off the table and I told the score. Then a girl said an "off the cuff' comment to me: "You're clearly the best here". What a difference a sentence makes. I went from, yes, probably being the best there give or take to being very, very average. Trying to play shots I wouldn't go for, letting the other player attack so I could show how awesome I was. Except I am not awesome. I am only a bit better than everyone else and it showed. I lost my next two games and I deserved to. Arrogance in table tennis, I have learnt, is punished severely. It isn't the first time I have behaved in that was and it wasn't the last. It isn't a conscious thing really it is just that you know you have more experience than some people and you should beat them. It makes you take your foot off the gas and next thing you know you are 10-8 down on game/match point. After, a little recovery I did get better again and won some more games but a combination of nerves, wanting to show Ben how "awesome" (there's that stupid word again) and the continued pressure of wanting to show I was the best meant I never obtained the heights I should have. Ironically, wanting to show Ben how great I was had done the exact opposite. The session was great though. I had learnt a lot, both about myself as a character and some glaring floors in my table tennis which were starting to hold me back. Fortunately, the weekend gave me some much needed practice time in London with an old friend. I don't have a lot of friends who play Table Tennis outside of the clubs I go to. In all honesty, until I played it, I thought it was a bit of a joke. Therefore, when he used to tell me he played table tennis I viewed it more akin to darts or pool than to sport. 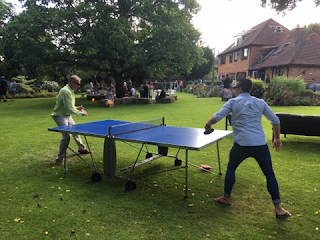 I hadn't seen him for over a year when we got back in contact and it would be nearly two years before we actually saw each other again but I like to think it is table tennis that has facilitated that. He was a regular feature in my other blogs, Mr Thomas Hue and is still a savage at table tennis. We met up at the Copperbox in London. I had never been an I was keen to go and see the venue. What was shocking is how underused the facility is. It is all state of the art with gorgeous facilities and, yet, it is a ghost town. Me and Tom had the place to ourselves. Tom plays with anti-spin. Basically, it plays very differently in terms of the spin that returns to a player and how much effect my spin will have on his bat. It is similar to pimples in some ways and definitely plays slower on occasion but he can reflect my speed back at me quite well. Initially, his game was patchy. He hadn't played much recently and there was a bit of rust that had crept in, in terms of putting the ball where he wanted on the table. However, he did show his class in the strokes he was producing. We played for over 3 hours in total and I got some great practice in. Tom is also left handed which meant that, for the first time in a long time, we could play forehand to forehand and vice versa. Likewise, his anti-spin meant I had to re-accelerate the ball again and again which helped me practice my topspin looping. His ability to use the whole table was the biggest differential between us. He could put the ball right in the corners and take advantage of my lack of positional awareness. It was something I cannot do to the same degree. Most matches, however, were quite close. Overall though he probably took me 2 out of 3 games or more. I also noticed how much I improved in both consistency and positional awareness. My crowning glory of this session was winning our final match 3-1. I went 1-0 down and I think both me and Tom thought I would capitulate, however, like I mentioned in the tournament post (http://epictabletennisjourney.blogspot.co.uk/2017/03/my-first-tournament.html) I am better when I am just focused on winning. I am more relaxed when I am into a game with purely 1 singular focus. This last game was more about the winning for me than at any other time that day. Therefore, I played better and, perhaps, put a little extra pressure on Tom in the process.